FORT aims to stay on the forefront of all issues related to shipping and fulfillment, and we are thankful that so much innovative logistical work has been done in other industries. We often look elsewhere for best practices and new approaches, or just plain for inspiration. We occasionally put out our own white papers on various topics that relate to our core platform as well. 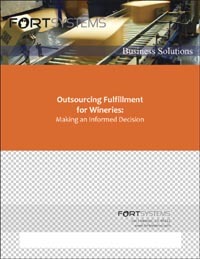 Please click the white paper image on the right to read our latest effort, "Outsourcing Fulfillment for Wineries."